Dominion Motor Car Company Ltd.
Cameron, Alex (or Alec) S.
Hamer, E. and Hamer, A. 1954 Georgia Street, 1964 (or 1962) Georgia Street, 1968 Georgia Street and 1974 Georgia Street. Louise Evelyn Fletcher was the widow of Christie West Fletcher. She lived at 996 Denman Street from 1918 to 1926. She was born on July 3, 1878 in Yarmouth, Hampshire, England. Her parents were William and Jane Conway. In 1908, in Wandsworth, London, England, Louise married Christie West Fletcher. He was born on December 12, 1874, in Kew, London, England. His parents were Charles and Lucy Fletcher. Charles Fletcher was a member of the London Stock Exchange. Christie had attended Lord Williams’s Grammar School in Thame, Oxfordshire. He became an indigo planter in India. He served with Lumsden’s Horse in the Boer War. He later became an electrician. Charles and Louise had a daughter named Lucy Evelyn Fletcher, who was born in Wandsworth, London. In March quarter, 1909. In September 1909, Charles came to Canada. He travelled through Quebec City on his way to Whonnock, British Columbia. In February 1911, Louise and her daughter, Lucy, travelled to Halifax, Nova Scotia, on the Tunisian. They were heading to Vancouver. From 1912 to 1915, the Fletchers lived on East 32 Avenue in Vancouver. In 1912, they were at 141 East 32 Ave.; from 1913, they lived at 162 East 32 Ave. Christie was an electrician, working for the British Columbia Electric Railway. In December 1914, Christie enlisted with the Canadian Expeditionary Force. He served with the British Columbia Regiment of the Canadian Infantry. He died in France on September 30, 1916. From 1918 through to the mid-1920s, Louise was living at 996 Denman Street. From about 1918 to 1923, Louise was an employee of the Canadian Patriotic Fund, which collected money to support the families of soldiers. The Vancouver office of the fund was at no 326, 736 Granville Street. Charles Herbert Bonnor (1870-1929), an accountant, was the local secretary of the fund. Goodbye Mary: the Patriotic Fund will care for you, 1914, http://www.virtualreferencelibrary.ca/detail.jsp?Entt=RDMDC-1914-18PATRIOTICFUNDITEM3L&R=DC-1914-18PATRIOTICFUNDITEM3L&searchPageType=vrl. 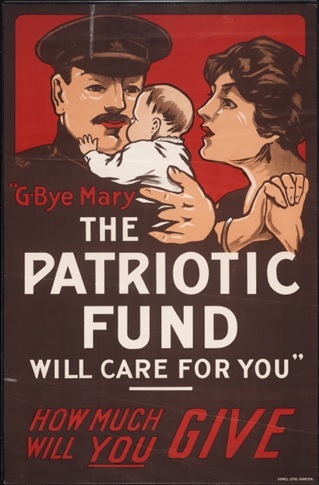 There were many predecessors of the Canadian Patriotic Fund. During the Boer War, an association appeared in Ottawa to create a fund to look after wives, children and dependants who were separated at home from those serving in South Africa. Other purposes of the fund were to look after soldiers and their families when the soldiers became wounded or sick while serving, as well as the widows, orphans, and other dependants of soldiers who died. The federal parliament established a more formal corporation to support these objectives: An Act to incorporate the Canadian Patriotic Fund Association, Statutes of Canada, 1901, chapter 92; amended by Statutes of Canada, 1908, chapter 96; and Statutes of Canada, 1909, chapter 67. Desmond Morton’s book, Fight or Pay, Soldiers’ Families in the Great War, Vancouver, University of British Columbia Press, 2004, describes the scheme in the First World War. With the leadership of Sir Herbert Ames of Montreal, the federal government established a Canadian Patriotic Fund in 1914. The fund used a combination of private and public money to support its activities. Although the fund did help, it was not perfect. There were strong social pressures to contribute to the fund, even if the contributors had little to give themselves. Even so, many families did not receive enough to support them. The administrators of the payments often intruded into private family lives to determine appropriate levels of payments. The federal government eventually took over many aspects of support for families of military personnel. After 1926, Louise lived at in apartment 10 at 920 Bidwell Street, with Lucy, who worked as a secretary for the Canadian Bank of Commerce. From 1932 to 1938, Louise was living at apartment 31 in Douglas Lodge, 1507 West 12 Avenue, sometimes with Lucy. Further information about Louise and Lucy is not available at this time. “England and Wales Census, 1881,” index, FamilySearch (https://familysearch.org/pal:/MM9.1.1/XQ7P-7D6 : accessed 23 Nov 2014), Christe Fletcher in household of Charles Fletcher, Clapham, Surrey, England; from “1881 England, Scotland and Wales census,” index and images, findmypast (www.findmypast.co.uk : DC Thomson, n.d.); PRO RG 11/, p. , The National Archives, Kew, Surrey; FHL microfilm . The History of Lumsden’s Horse: A Complete Record of the Corps From its Formation to its Disbandment, ed. Henry H.S. Pearse, London Longmans, Green & Co., 1903; https://archive.org/stream/historylumsdens00peargoog#page/n13/mode/1up; https://archive.org/stream/historylumsdens00peargoog#page/n524/mode/1up; https://archive.org/stream/historylumsdens00peargoog#page/n455/mode/1up; https://archive.org/stream/historylumsdens00peargoog#page/n481/mode/1up. “England and Wales, Marriage Registration Index, 1837-2005,” index, FamilySearch (https://familysearch.org/pal:/MM9.1.1/2DXY-Q1N : accessed 23 Nov 2014), Christie West Fletcher, 1908; from Marriage, Wandsworth, London, England, , “England & Wales Marriages, 1837-2005,” findmypast. “Canada Passenger Lists, 1881-1922,” index and images, FamilySearch (https://familysearch.org/pal:/MM9.1.1/2QSP-5MT : accessed 23 Nov 2014), Christie West Fletcher, Sep 1909; citing Immigration, Quebec City, Quebec, Canada, T-4763, Library and Archives Canada, Ottawa, Ontario. Canadian Expeditionary Force; Name: Fletcher, Christie West; Regimental Number: 107212; Date of Birth: 12/12/1874; Reference: RG 150, Accession 1992-93/166, Box 3144 – 31; Item Number: 393883; http://www.bac-lac.gc.ca/eng/discover/military-heritage/first-world-war/first-world-war-1914-1918-cef/Pages/item.aspx?IdNumber=393883. “Find A Grave Index”, index, FamilySearch (https://familysearch.org/pal:/MM9.1.1/QVKR-1F7S : accessed 23 Nov 2014), Christie West Fletcher, 1916. The Old Tamensians’ Association, Christie West Fletcher, http://oldtamensians.info/the-great-war/. Lance Corporal Christie West Fletcher, http://www.canadiangreatwarproject.com/searches/soldierDetail.asp?Id=47121. “England and Wales, Birth Registration Index, 1837-2008”, index, FamilySearch (https://familysearch.org/pal:/MM9.1.1/2XXY-X82 : accessed 23 Nov 2014), Louise Eveline Conway, 1878. “England Births and Christenings, 1538-1975,” index, FamilySearch (https://familysearch.org/pal:/MM9.1.1/N6PK-3NY : accessed 23 Nov 2014), Louise Evaline Conway, 15 Sep 1878; citing Yarmouth, Hampshire, England, reference item 1 p 48; FHL microfilm 1470905. “England Births and Christenings, 1538-1975,” index, FamilySearch (https://familysearch.org/pal:/MM9.1.1/N2RX-XZQ : accessed 23 Nov 2014), Louise Evaline Conway, 15 Sep 1878; citing Yarmouth, Hampshire, England, reference ; FHL microfilm 1470905. “England and Wales Census, 1891,” index, FamilySearch (https://familysearch.org/pal:/MM9.1.1/4QXG-L6Z : accessed 23 Nov 2014), Louise Conway, England; from “1891 England, Scotland and Wales census,” index and images, findmypast (www.findmypast.co.uk : DC Thomson, n.d.); PRO RG 12, county, registration district, subdistrict, The National Archives of the UK, Kew, Surrey. “England and Wales, Birth Registration Index, 1837-2008”, index, FamilySearch (https://familysearch.org/pal:/MM9.1.1/2FKS-P37 : accessed 23 Nov 2014), Lucy Evelyn Fletcher, 1909. “Canada Passenger Lists, 1881-1922,” index and images, FamilySearch (https://familysearch.org/pal:/MM9.1.1/2H2B-TKF : accessed 23 Nov 2014), Lucy Fletcher, Feb 1911; citing Immigration, Halifax, Nova Scotia, Canada, T-4738, Library and Archives Canada, Ottawa, Ontario. “British Columbia Marriage Registrations, 1859-1932,” index and images, FamilySearch (https://familysearch.org/pal:/MM9.1.1/JD8G-DS2 : accessed 23 Nov 2014), Charles Herbert Bonnor and Emily Jessie Morrison, 09 Jan 1909; citing , British Columbia, Canada, British Columbia Archives film number B11388, Vital Statistics Agency, Victoria; FHL microfilm 1984109. “British Columbia Marriage Registrations, 1859-1932,” index and images, FamilySearch (https://familysearch.org/pal:/MM9.1.1/JD8G-FV9 : accessed 23 Nov 2014), Charles Herbert Bonnor and Emily Jessie Morrison, 09 Jan 1909; citing , British Columbia, Canada, British Columbia Archives film number B11388, Vital Statistics Agency, Victoria; FHL microfilm 1984109. “British Columbia Death Registrations, 1872-1986,” index and images, FamilySearch (https://familysearch.org/pal:/MM9.1.1/FLGD-RXV : accessed 23 Nov 2014), Charles Herbert Bonnor, 08 Jul 1929; citing Vancouver, British Columbia, Canada; British Columbia Archives film number B13135, Division of Vital Statistics, Victoria; FHL microfilm 1952635. Charles Herbert Bonnor, death notice, Vancouver Sun, July 9, 1929, page 12, http://news.google.com/newspapers?id=6W9mAAAAIBAJ&sjid=6IgNAAAAIBAJ&pg=2986%2C968158. “British Columbia Death Registrations, 1872-1986,” index and images, FamilySearch (https://familysearch.org/pal:/MM9.1.1/FLTK-FP5 : accessed 23 Nov 2014), Emily Jessie Bonnor, 19 Jun 1964; citing Vancouver, British Columbia, Canada; British Columbia Archives film number B13267, Division of Vital Statistics, Victoria; FHL microfilm 2033690. “British Columbia Death Registrations, 1872-1986,” index and images, FamilySearch (https://familysearch.org/pal:/MM9.1.1/FLLS-M6P : accessed 23 Nov 2014), Anne May Bonnor, 03 Feb 1985; citing Vancouver, British Columbia, Canada; British Columbia Archives film number B16571, Division of Vital Statistics, Victoria; FHL microfilm 1358011.